The Bratz... a toy line and apparently also a CG-animated TV series. All I know about them is what I've learned from the toy commercials, and that, my friends, is that the characters all have giant heads with really long hair. Yep, that's it. That's all I knew. 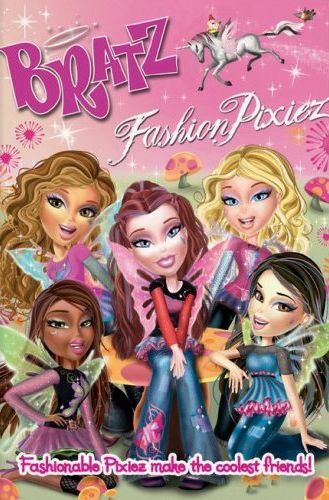 So when I decided to check out this new feature length DVD Bratz - Fashion Pixiez, I really had no idea what to expect. Know what I found? All the characters have very big heads with long hair! And the hair was very nicely done in their CG environment. If flowed and moved naturally, and reflected light and cast shadows. The programmers either spend a lot of time on the hair engine, or the managers spent a lot of money on purchasing one. The overall art style is surrealistic, as you'd probably expect with characters that have giant heads. What really caught my eye was the way the characters moved, almost like marionettes on strings. Not that this is bad or anything, it was just an observation, and actually kind of gives it a unique feel. Another thing I noticed was that this had some mature themes, or at least more mature than what I was expecting. More like it was made for teens than for kids. For instance, the main male in the series had his black book with the numbers for all his "honeys". I suppose this series could actually be directed towards teens rather than kids, but the overall story of the movie didn't give me that vibe. And that brings me to the story. Cymbeline and Breeana are sisters. Cymbeline's birthday is coming up, though her younger sister seems more excited about it than she does. Cymbeline seems mostly interested in getting her present, which her dad says she cannot have until she turns 18. One would most likely assume this to be a car, but shortly there after we see sparkling light and then her disappearing off of a cliff. And seeing as how the title of the film is Bratz - Fashion Pixiez, it's pretty easy to conclude that Cymbeline is a pixie, and that her gift is something more than just a car. Cloe, Jade, Sasha, and Yasmin are Cymbeline's friends, and apparently don't know about all this pixie stuff. But they do realize something is going on with her, as she not only seems distracted and disconnected, but she also seems to be all buddy-buddy with a new goth transfer student. Dylan, the main male character I mentioned earlier, get's his bag snatched by a bird, jumps on his motorcycle chasing after it, and winds up in a secluded forest area standing face-to-face with this goth girl, Lina. She seduces him with music, putting him under a spell. Meanwhile, Cymbeline's friends are worried about her, so they go to her house, even though they know Cymbeline and Breeana's dad doesn't like visitors. After doing some snooping around, then bump into Breeana, who eventually shows them this alternate pixie world which exists along side the human word, but invisible to human eyes. It's a bright, colorful world, where pixies help humans out so that they feel all goodie-goodie inside. So what's the plot here? Basically, Lina wants to be the most powerful pixie, so she is putting people under spells to create her army to stand against the pixie queen, which happens to be Cymbeline and Breeana's dad. It's kind of a simplistic plot, and really took quite a while to really get to the meat of it. Plus, the conclusion to the plot barely seemed to exist. There was very little conflict or effort put into prevailing against the evil. This is why it seemed more like a movie made for kids. It had a unique style, with some nice little funny parts scattered about, but overall it just wasn't deep enough for me. The extra features on the DVD include a Karaoke music sing-a-long, a music video, a "Pixie Vision" memory interactive game, a "Fashion Stylin" interactive game, and a first look at Bratz Kidz Sleep-Over Adventure, the first Bratz movie.